Select SNG, MTT or create your own custom tournament with any payout structure you need. Define the stack sizes, player actions and blind sizes. Choose ICM or Chip EV model. Calculate the Nash equilibria for your setup and find out the optimal push/fold ranges for all players. Easily edit the ranges so that the push/fold chart reflects the game specifics at any limits, from 10 cents to hundreds of dollars. Get your perfect situation-specific push/fold chart! 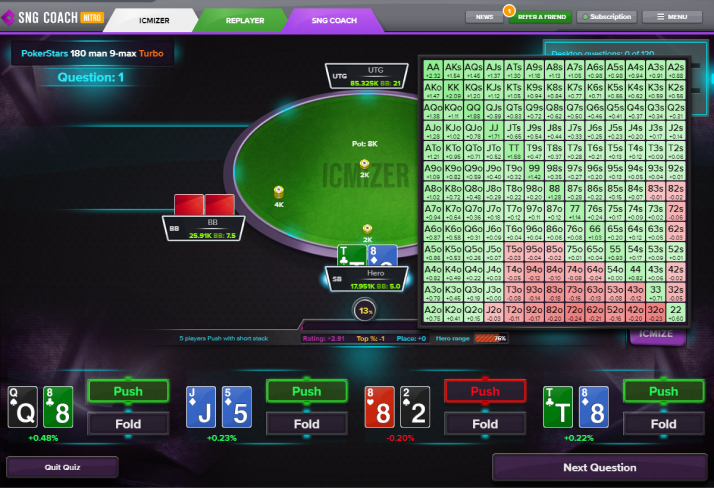 Using its accurate simulation engine, ICMIZER will quickly give you the perfect push/fold chart for each hand for the specific situation you’ve just set up, taking into account all its distinctive characteristics. Get perfect push/fold charts for any setups in SNGs and MTTs. Calculate Nash equilibria based on ICM and Chip EV simulation models with a quick and user-friendly preflop calculator, time-tested and trusted by thousands of poker players worldwide. Find out what all ICMIZER has to offer in this step-by-step video tutorial. Learn the most effective ways to break down any hand at any limits. Once a fun family card game, poker has long turned into an intellectual competition, which the smartest players are using to cash in on their honed skills. It’s all or nothing. Skim the cream – or go home sour. The stakes are highest at the late tournament stages, where even a minor misstep can make the difference between triumph and elimination. How do you make this decision? It all depends on the situation. Certain situations are meant for pushing, while others dictate that you fold even if your hole cards look strong at first glance. Skilled PUSH-FOLD play is key to a successful tournament game. Find the right time to steal the blinds, and the perfect moment to double your chips. Some say poker is about luck. Nothing could be further from the truth. In the long run, more tournament winnings are collected by those who use modern tools and technologies. It’s not a question of “Do you agree with this view?”, but how soon you’ll come around. Just remember that while you’re catching up with the state of the poker art, other players aren’t twiddling their thumbs either. They’re power-leveling their skills. So, what exactly is ICMIZER? 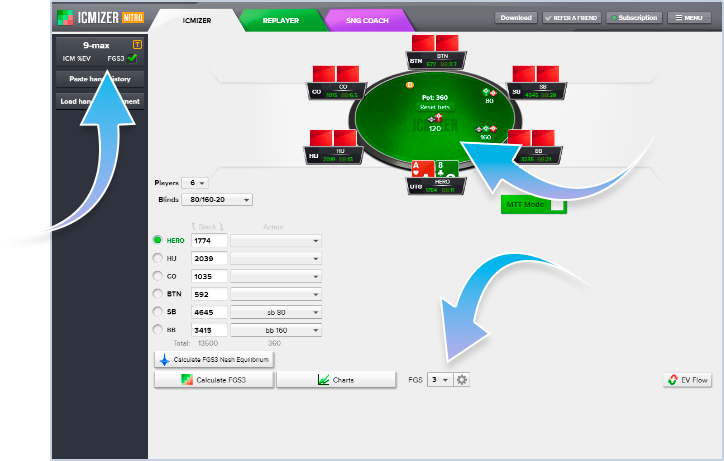 ICMIZER is an advanced poker calculator that helps you make the right preflop decisions at late tournament stages. Powered by ICM and FGS models, it knows exactly whether you should PUSH or FOLD — in every single situation. Why dive deep into mental analysis and calculations when ICMIZER can do it for you – more quickly, accurately, and reliably? While other players are still trusting their gut feeling and playing it by ear, you can bet on clear and precise mathematics. ICMIZER is your SECRET WEAPON in the PUSH-FOLD game. When Should I Use ICMIZER? ICMIZER is a poker calculator that can pump up your skills in SNG, MTT, MTTSNG, and Spin & Go tournaments. If you play on PokerStars, 888 Pacific, PartyPoker, Microgaming, iPoker, FTP, Ignition, Winning Poker Network, Merge, or Winamax, then ICMIZER is for you. Late tournament stages are very different from cash poker games. Your deep starting stack of 50-100 BBs can easily go drop as low as 1-20 BBs, completely changing your strategy. The further you go into a tournament, the fewer rivers and turns you get to see. The flop is usually it. You can’t raise on the turn, nor can you afford to fold. Short-stacked in the late stages, going all-in remains your only weapon. Hence the nickname PUSH-FOLD stages, where most players are limited to either folding or going all-in as early as the preflop, without seeing the flop or getting a feel for their opponents’ hole cards. The SB is going all-in for the umpteenth time, and you want to figure out what kind of hand would be strong enough to call with. You’re not sure how to get through the bubble phase of MTTs, and when you do reach the final table, your stack is usually short. In SNGs you often place second and third, but first place just seems to elude you. You’re short-stacked with 5 BBs and you’re trying to pick the right moment to go all-in. You’re not sure how these knockouts or progressive knockouts affect your decision. The BTN is stealing the blinds every time, and you keep guessing how wide his hand range is to call your all-in from the SB. You have a big stack and are thinking how to play against an opponent with a short stack and a weak hand. Everyone at the table is short-stacked, but you’re on UTG now and next hand you’ll be on the BB. You want to understand how this impacts your current playing decision. You’re medium-stacked with 10 BBs and an average hand (like 66). Your deep-stacked opponent goes all-in and you are deciding how to counter. Whatever the situation, you either win or lose. to start collecting more prize money in tournaments. Why Will I Win More with ICMIZER? When people need to compute something complicated today, they use calculators — including yourself. ICMIZER is that calculator for you when you play poker. If you’ve ever played in an MTT, you know that doubling your chip stack doesn’t mean doubling your equity in a tournament . The number of chips you have and their actual money value are not the same thing. As you make any decision at the table, you calculate the expected value of each move in terms of how many chips it can net you. But to do this optimally, you need to understand what those chips are worth. This is where the ICM (Independent Chip Model) comes in. ICM analyzes a given situation at the table statically — with no regard for player positions, blind sizes or their movement. While ICM is an important basis for evaluating chip values, ICMIZER also works with the FGS model (Future Game Simulations). Unlike ICM, FGS takes into account the sizes of blinds and their movement around the table, as well as player positions. What’s more, it can look several moves ahead. Poker is a finite game. As the renowned mathematician John Nash proved, any finite game has an one equilibrium strategy. For PUSH-FOLD stages, this means players have no advantage to gain by diverging from that optimal strategy. ICMIZER uses advanced algorithms to calculate Nash equilibrium ranges and pinpoint the optimal preflop strategy. It does this for any specific situation at the table, factoring in the tournament payout structure. If all this poker math sounds complicated to you, you’re not alone. This is exactly why ICMIZER was created — to take care of the analysis work for you. SNG Coach for practicing your SNG & MTT skills. Replayer for reviewing played hands. 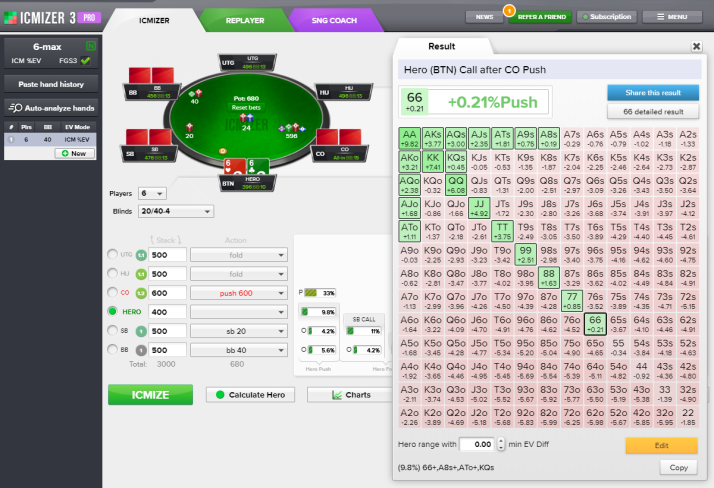 The ICMIZER calculator tells you if you should PUSH on the preflop, given any situation at the table. ICMIZER can quickly and easily simulate any tournament with 20 or even 200 payouts, which is especially important if you’re an MTT enthusiast. 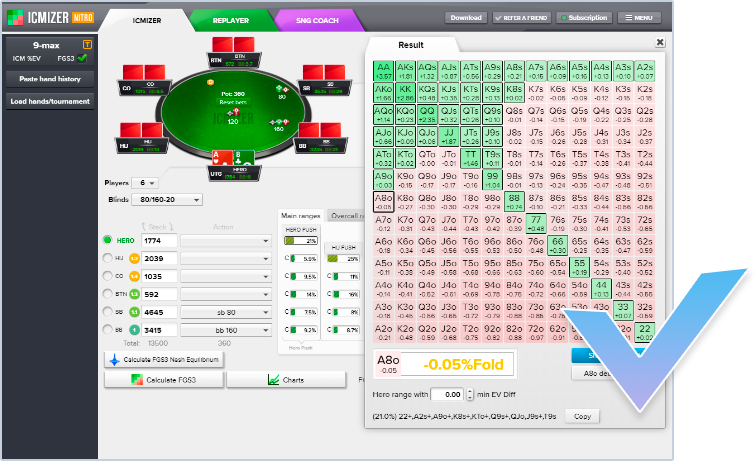 ICMIZER can also figure out tournaments with progressive knockouts for the final table, based on IKCM and FGS models. 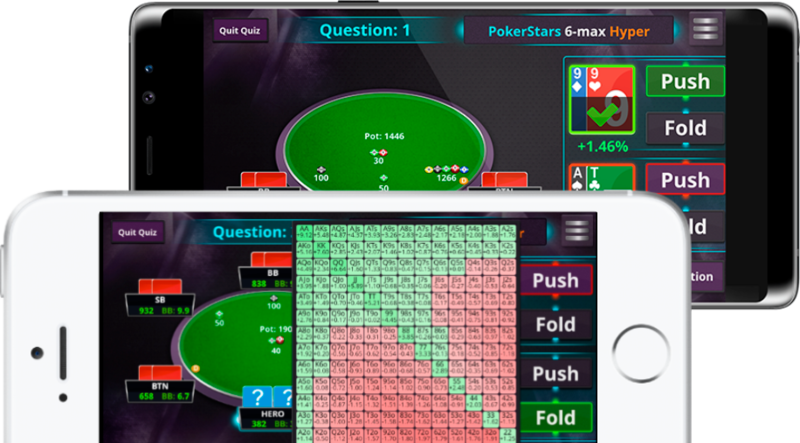 VISUAL & USER-FRIENDLY — Simulates and analyzes any setup and visualizes it on a poker table. CALCULATES ACCURATELY — Calculates with surgical precision by relying on the FGS model, which takes into account blind dynamics, ICM algorithms and CHIP EV, including all possible card blocking options. 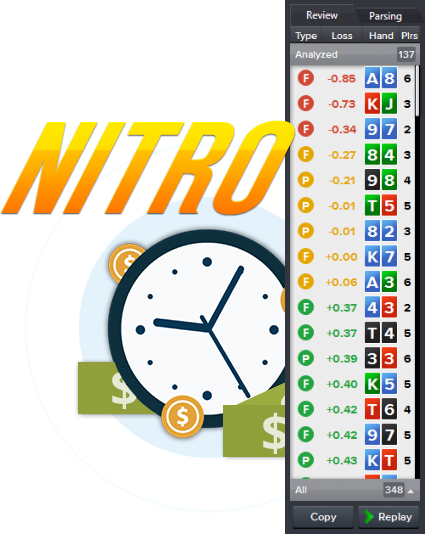 Tells you how to play optimally with each of 169 possible hands in any situation. HANDLES ALL TOURNAMENT STAGES — eliably processes all tournament stages up to the final table. You can even set the number of players and stack sizes on other tables (for up to 60 players still in the tourney). FIXED-DEPTH FGS MODEL — Can look one or more hands ahead, thanks to added FGS depth, all the while accurately reflecting game and blind dynamics. Select a tournament type (all popular types are supported). Enter the number of players, blind sizes and stack sizes. Consult the resulting Push/Fold chart. Strong hands are shown in green, while weak hands are red. That’s how you know if you should PUSH or not. Meet your personal PUSH-FOLD coach, who will train you to make the best decisions in specific situations that typically occur at the table. It has answers to the two key questions you should be asking yourself: What areas of my game should I work on? and How do I go about it? SNG Coach adapts to your personal knowledge and skill level. Depending on that, it tailors the difficulty of the situations (and answers) it gives you. Select a type of tournament (or Chip EV mode). Set the number of players and stack sizes. Choose if you want to practice going ALL-IN or countering an ALL-IN. SNG Coach drills you on specific situations that you typically encounter throughout a tournament. To solidify your knowledge, it gives you four hands to make a decision for each. Then it tells you the best play for each hand in the given situation. You can see at a glance why you’ve been underperforming, and can focus on improving your weaker areas. Select a hand history to review. Or find hands with the biggest won or lost pots. 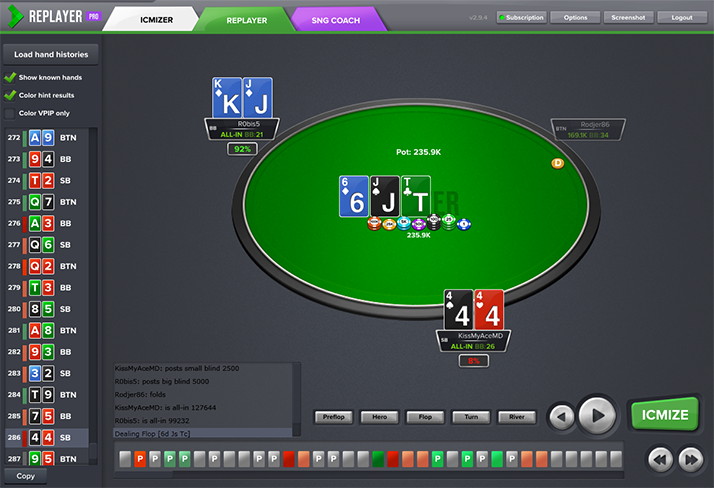 Filter hands by action (PUSH first, counter an ALL-IN, or counter two ALL-INs). See how each player’s odds change as the hand progresses. 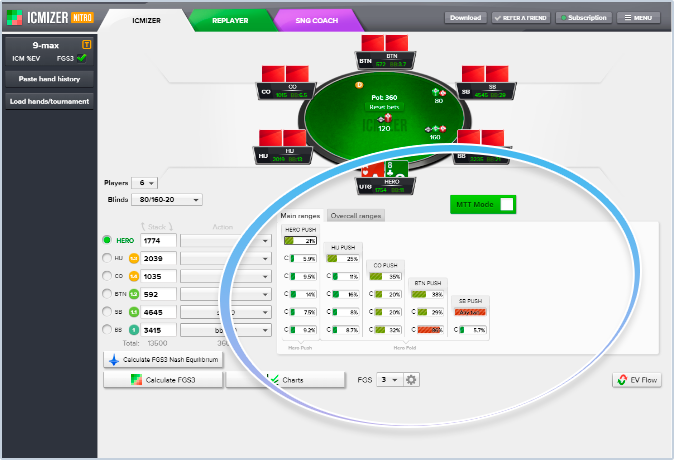 Any hand or situation you see in Replayer can be sent straight to ICMIZER for more comprehensive analysis. ICMIZER Helps Players of All Levels! Are you a beginner? First, ICMIZER will help you boost your tournament ROI at your current limits. After you step up your strategy, you can then move on to higher limits which open the door to serious profits. Are you good but short of a pro? ICMIZER will help you turn pro faster by winning more. You will also be able to compete with players who already use ICMIZER. Are you a pro? Many pros, especially those who play at medium and high limits, are already using ICMIZER. The field is getting stronger every year. Performing well in tournaments and making money off poker takes a lot of knowledge and self-improvement. Then again, why study everything if there are specialized tools that make it easy? Put the numbers in, simulate a situation, and there’s your perfect solution! How Much Does ICMIZER Cost? Since ICMIZER first hit the market in 2012, thousands of players from over 60 countries have come to appreciate ICMIZER and are using it on a regular basis to keep their skills as sharp as possible. “I’ve been playing SNG professionally for about 3 years. My background was a few poker books plus I would review some hands in simplistic simulators. Then a friend told me about ICMIZER. Now, a year later, I’ve analyzed thousands of complex situations, I’m beating the ‘average’ field, I’ve completed thousands of tournaments, and I’m finally reaching medium and higher limits. “I began to use ICMIZER 4 months ago. I love how the app is intuitive, everything is easy to use, and it can work with any ranges. In just 2-3 weeks I started feeling I was getting better at pushing. About 2 months later I really ‘got’ calling and re-pushing. The built-in SNG Coach app is great to figure out all kinds of game situations. I am now making better calls and really feeling the dynamics at the table. “Poker is not about gambling anymore, it’s more of a science, you need skills and to play smart. One trend I’m seeing is to rely on ICMIZER, instead of going deeper and deeper into the mazes of poker strategy that are out there. By investing in ICMIZER, you invest in your poker career. Winning steadily and grabbing those first prizes will come to you sooner and with less pain, with a reliable virtual assistant like ICMIZER – your poker wild card. ICMIZER is used by thousands of players worldwide. Give it a spin today. we will refund 100% of your purchase!